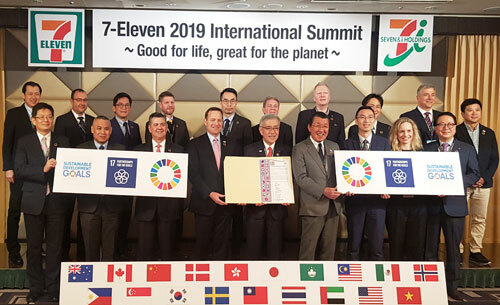 We,the duly licensed operators and stewards of brand 7-Eleven, meeting in Tokyo,Japan, on this day, 28 March 2019, pledge to continue operating as a socially-responsible brand in support of the 2030 Sustainable Development Goals Agenda. On behalf of the communities we serve, we commit to having a positive impact on our global society and at the local level where we own and operate 7-Eleven stores. 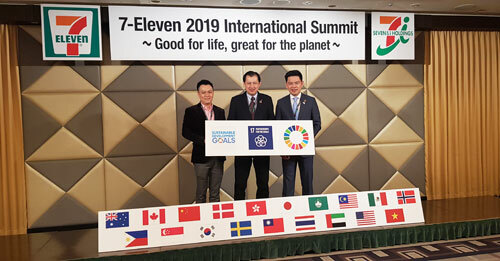 The 7-Elevenbrand is committed to achieving sustainable development in its three dimensions –economic, social and environmental-in a balanced and integrated manner. Between now and the end of 2030, the 7-Eleven brand is resolute in our commitment to create conditions for sustainable, inclusive and sustained economic growth, shared prosperity and decent work for all. One method in which this may be accomplished is through SDG # 17 : Partnerships for the Goals. We will work to strengthen the implementation and revitalization of global partnerships while taking in account the various levels of national and local development. As we embark on this great collective journey, it is our hope that all goals and targets are met by all nations, people and segments of society!